Above left: CAS Executive Director Karissa Niehoff, Awards Committee Member Loraine Giannini and WFSB’s Hena Daniels present the “CAS Elementary School of the Year” banner to Alcott Elementary Principal Holly Wren. Above right: CAS Executive Director Karissa Niehoff, Award Committee Member Norma Posocco and WFSB’s Hena Daniels present the “CAS Middle School of the Year” banner to Sage Park MS Principal Paul Cavaliere, Jr. 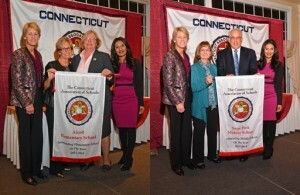 The Connecticut Association of Schools’ Recognition of Excellence in Education celebration was held at the Aqua Turf Club in Southington on November 19, 2013. Over 600 guests were in attendance to honor deserving schools, programs and individuals. Wolcott’s Alcott Elementary School and Windsor’s Sage Park Middle School were recognized as the CAS Elementary School of the Year and the CAS Middle School of the Year, respectively. Also recognized were the CAS Outstanding First Year Principals and Exemplary Educators for 2013-2014. Hena Daniels from Channel 3 WFSB Eyewitness News was the master of ceremonies; and Dr. Karissa Niehoff, CAS Executive Director, gave the welcome address. The culminating event of the evening was the presentation of the CAS Recognition of Excellence in Education Awards to teachers and staff from schools across the state. These individuals were selected for public recognition for the time and talents they have shared and for the commitment to excellence they have demonstrated. The CAS Recognition of Excellence in Education celebration was made possible by the generosity of Horace Mann Insurance.